I find that I can no longer go along quietly. I need to speak out against something that has bothered me tremendously for many, many years. I have been watching our entire country and much of the world abdicate to doctors, against all common sense, the health and welfare of their infants. Doctors are not Gods. They are fallible beings. And I am convinced that about this they have been WRONG! I am talking about babies sleeping on their backs. Babies should be sleeping on their stomachs. There are many reasons for this but first and foremost, they sleep better – which is good for them and their parents. Sleeping well is good for their brains, bodies, development, health, happiness and well being. The Back to Sleep campaign turned 20 last year. It’s been 20 years and billions of dollars spent on a campaign that has been the single-most harmful thing to happen to children in recent history. This campaign which promised to help save infants has only hurt and damaged them. There have been no benefits whatsoever. The number of Sudden Infant Death Syndrome (SIDS) cases has not decreased. Did you hear that? No reduction in the rate of SIDS!!! 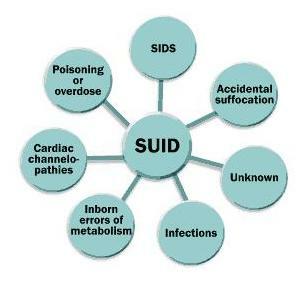 That is because at the exact time the “back to sleep” campaign started, the CDC changed its definition of SIDS and created an umbrella called Sudden Unexpected Infant Deaths (SUID). Any baby deaths which aren’t easily explained are investigated and then labeled as SIDS or Accidental Suffocation Strangulation in Bed (ASSB) or one of a number of other new categories. 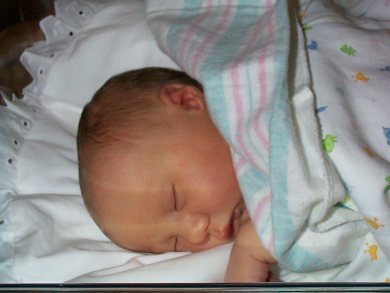 Deaths which were formerly all labeled SIDS are now spread over a number of labels. Yes, the SIDS rate has been declining significantly since the early 1990s. However, CDC research has found that the decline in SIDS since 1999 corresponds to an increase in SUID deaths during the same period. When added, categories actually exceed the number of SIDS cases ever reported. Especially targeted since these new labels came about are babies co-sleeping with other humans such as parents and older siblings. The assumption is that any baby not sleeping alone is at risk of having been suffocated. Any baby sleeping with soft blankets and pillows at the time of death is investigated. Any baby caught sleeping with a trianglar wedge (ironically used to keep him from rolling to his stomach) is investigated. But when you read about these investigations, they seem very biased. There seems to be an assumption that if a child is bed-sharing, he was suffocated. If there is a heavy comforter, he suffocated. Because there is no good way to test for suffocation at autopsy, most of these deaths, after the investigation, are then grouped under the new accidental suffocation label (ASSB). 1992 was the year that the American Academy of Pediatrics began recommending that infants be put on their back (supine position) instead of their stomach (prone positon) when being put down for sleep. At the time more than 75% of parents put babies on their stomach for sleeping. The recommendations of the AAP have grown more strident over the years; moving from only recommending back sleeping to reduce the risk of SIDS to saying that ONLY the back was safe. So why did this campaign begin initially? My research isn’t coming up with a clear-cut answer. I think most people think it’s because SIDS babies were ones who suffocated while sleeping on their stomachs so if they sleep on their backs they won’t suffocate. That was part of it. But there was additional research at the time of the campaign’s beginning showing that babies slept less soundly on their backs and that SIDS victims possibly had brain-stem defects making them unable to awake from deep sleep so all babies should be put on their backs to avoid deep sleep. Also, babies in China commonly slept on their backs and SIDS was lower there so, clearly, we should sleep babies on their backs too. My own children were able to crawl to me at birth when left on their stomach at the bottom of the bed – supposedly following the smell of breast milk. This phenomenon of newborn slithering can be googled and watched on you tube. These reflexes are likely vestiges of being evolved mammals. The elaborate contortions a blind and hairless baby kangaroo goes through to get out of its mother’s uterus and into her pouch to suckle at her mammeries are the same reflexes humans are born with. The point is, babies are mobile. They can find air when they need to. Babies are intrinsically led to move in ways which perfectly strengthen and tonify them. One of the problems with sleeping children on their backs is the lack of opportunity to develop their neck muscles. This is leading to “gross motor milestone” delays and is even negatively impacting social skills. Here is Penelope Leach from Your Baby and Child. “By six weeks most babies will have got their necks sufficiently under control to be able to balance their heads upright as long as whoever is holding them keeps still…. Over the next six weeks or so those neck muscles get firmer and his control moves gradually down to include his shoulders…By the time he is three months old the control of his head will be complete.” This is simply no longer true. I now regularly hold 6 month old babies who cannot hold up the weight of their own heads. I sat at a my daughter’s math competition in a large high school auditorium filled with 6th, 7th, and 8th graders. As I looked at the row of children in front of me I was struck with the fact that each and every one of them had a distinct flatness to the back of their heads. We are simply changing the shape of humanity. A newborn has just spent his time in-utero curled forward in a scrunched up position. 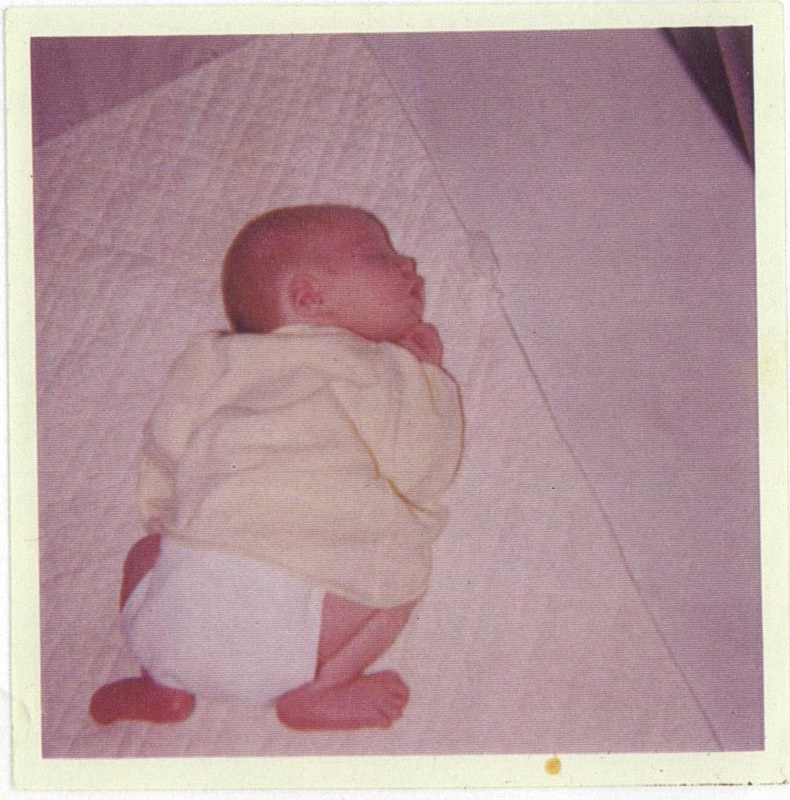 After birth his body very naturally curls itself inward no matter what position he is in. His large and heavy head act as “an anchor and a pivot” according to Penelope Leach. It is always turned to one side. The most natural position is for him to be on his stomach with his heavy head down, still turned inward but to the side. Babies develop from the top down and the middle out. This is something everyone learns in Child Development 101. It is called the cephalocaudal-proximodistal trend. Babies will use their upper limbs before their lower limbs and gross motor development will move from the center out so they will move their arms laterally before they will grasp with their fingers. Therefore the neck, upper back and arms are the first things the baby can control. Because of inborn reflexes, they can also scoot and lift their head. And a newborn can only focus his vision about 12 inches (the distance to his mother’s eyes in the nursing position). So in the tummy down position, everything is working for him. He can focus on what is in his line of site because it is all close. He can also easily reach his hands for self soothing and his Moro reflex which causes him to flail and startle is not activated on his stomach. We develop as individuals the same way that we evolved as humans. In a prone position, a baby will slither like a snake. Before long he discovers he can use his arms as support to push up to his chest like a lizard. If given lots of free time on the floor he will: roll; army crawl symmetrically; pull his legs up and see-saw on all “all fours” like most mammals. Soon he is standing upright and walking just like homo sapiens. When I was a sought-after babysitter in the 1970s, you could predict what was happening in every house in our child filled neighborhood. Under 12 months children were put down to sleep on their stomachs from 9-11 and 1-3. The only difference from house to house was whether a particular mother took off the lace-up white leather shoes. After nap a child was fed and a non-mobile child put in his playpen on his back. Once he could crawl he was allowed to play in certain kitchen cabinets and a gate was put up at the basement stairs. In that neighborhood, children were rolling from stomach to back by 8-10 weeks. Children were rolling from back to stomach by 12-14 weeks. Why not give a child two months to sleep in this natural and safe position where he develops the strength to then be free to move to his back if he wants to. This seems like the most natural thing in the world to me and gives him so much more agency over where and in what position he would like to be. This misguided campaign has not only NOT reduced infant deaths but has created a myriad of developmental problems and delays and our children are suffering tremendously because of it. katepflynn has obviously done much research and knows a lot about this subject. I had 5 children and would never have considered for an instant putting an infant on its back. Kudos to her for her tireless soulsearching! Definitely not being facetious, “never have considered for an instant” — why not? Hi Matthew. I think I can answer. The commenter raised her children before the campaign started when this was not an issue. Thanks for reading! Hi Kate…Thank you for writing! Especially with such circumstances, much appreciated. I received your writing from Dan Rindler as a colleague in his Child’Space chat room. In reviewing some statistics on the matter you’re probable right on society’s influencing factor being there or not. However, if the timing of social information was there or not, I’m wondering, because the other commentators statement was so strong, if there where presentations by her children that just said “No way I’m going on my back, I’m headed to my tummy.” I’ve heard in more then one household I’ve visited the story of a little one sleeping in tummy time with the “rump up”. So, to the mother, was there a drive sensed some how to be in some position? Or, perhaps is was just an ease that flowed into what was the most efficient at the time? I just came from a meeting where there was a 2-3 month baby. He got cranky, mom looked at her watch and said it was past nap time…the half closed eyelids looked to confirm mom’s observation, a few minutes later looking over I saw the baby asleep, on tummy, across mother’s thighs. Something from my readings on the subject that struck me as in tune to some of Dr. Shelhav’s Child’Space teachings was the softness and lightness of materials. When discussing toys she pointed out how so many were so light and without texture that the baby/young child didn’t receive much meaningful input as far as tactile and proproiception; because of that emotive. For me the answer has always become trying to do something to enhance the awareness between parent/care giver and baby/child, for whatever the circumstance and intention. Thanks again for writing and being courageous. Thank you for writing this article and for giving very detailed information about SIDS. For me it was shocking to read how they influence statistic outcomes by renaming the unexpacted death of a child. Also in the Netherlands parents are adviced not to sleep on the belly to avoid sudden infant death. Parents got scared for ‘tummy time’ so lot of children are not used to ly on their belly what makes the delay in development even more obvious. I am so glad I found this. My husband and I never felt right about having our baby sleep on his back but went against our better instincts due to the fear campaigns. He was holding his head up at 6 weeks and we thought he was ahead of the game. He is a little over 4 months now, hopefully we didn’t do too much damage by having him sleep on his back. He doesn’t seem to sleep well on his back and prefers the side sleep position, which I often have him sleep in. It is belly sleep from now on. Thanks for the article. Have you ever read about the practices at the Pikler Institute? I would be interested in knowing your opinion on that. I do know about the Pikler Institute. I took the RIE foundations class in California and had learned about Magda Gerber and Emi Pikler in my Montessori 0-3 training. Here is what I don’t understand about their strict views about babies on their backs. When you look at all of the drawings Pikler did about child development – they always begin with a child on her stomach. They say that when the child can get to his stomach on his own then he’s ready to be there. My theory is: if you can get from stomach to back by 3 months and back to stomach by 5 months, don’t you give a baby more freedom and more choice by putting him on his stomach? Then, if he wants to be on his back he can put himself there. If he wants to be on his stomach, he can stay where he’s been put. The fact is, I put my own children on their backs to play and on their stomachs to sleep. I thought this was a good balance. What do you think?